Don't look now, Apple fanatics, but Android's just made another noteworthy leap in mobile market share. 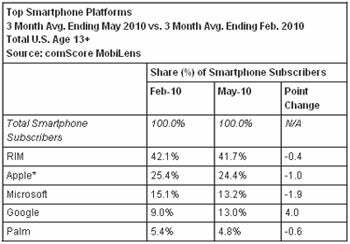 Google's Android platform grew by 44 percent from February to May, according to a report released Thursday by ComScore. During the three-month period from December to February, Android commanded an average of 9 percent of the U.S. smartphone market. In the next three-month period, from March to May, it had shot up to an average of 13. Now, it goes without saying that 13 percent is still a relatively small piece of the pie. But the overall trends are what we're watching here -- and, gauging by a wide range of data from numerous sources, Android is showing consistent growth at a pace its competitors can't match. For anyone who keeps an eye on mobile market trends, the pattern is quickly becoming familiar: In most time periods, and by most measures, Android makes a healthy jump, RIM shows signs of slipping, Microsoft takes a hit, and Apple stays steady or experiences a modest drop. In the case of the latest data from ComScore, Apple lost about 4 percent of its U.S. market share, falling one point to 24.4 percent. Of course, these were the months leading up to the release of Apple's iPhone 4, so it's no big shock that sales were slow. Even following the launch of the iPhone 4, though, I'd be surprised if we saw any massive surge in Apple's relative share. Merits of one platform over another aside, the math tells you everything: No matter how magical and/or revolutionary Apple's products may be, we're looking at a game of numbers. That's why, when considering market share data last month, I declared that Apple had fallen and couldn't get up. By that, I'm not implying that Apple is doomed or even performing poorly; obviously, the company is doing quite well and showing no signs of struggle. What I'm saying is that when it comes to relative market share, the odds are simply stacked against it; the iPhone suddenly starting to grow at a faster rate than Android seems highly unlikely. All right, so what about the iPhone 4? Will it suddenly shoot Android into oblivion and help Apple regain its position as the de facto standard? I wouldn't hold your breath. Yes, Apple sold a lot of new iPhones in those first weeks. But it only makes sense that most of those early buyers were diehard iPhone fans who, by the very nature of their fandom, already owned iPhones. As I've pointed out previously, dropping one iPhone and picking up another has no impact on the overall market split. The reality is that new high-profile Android handsets are hitting store shelves practically every month -- handsets like Motorola's Droid X and the multicarriered Samsung Galaxy S -- and those are attracting an awful lot of new customers. Last month, Google said it was activating 160,000 new Android devices every day, and that was before the Droid X had even been announced. Older Android handsets are slowly but surely starting to receive the Android 2.2 upgrade, giving them fresh life as well. In order to reverse the shifting market share trends, Apple's iPhone 4 would have to outpace the growth of that entire ever-expanding fleet of Android phones. Even if the iPhone 4 didn't require a Jedi voodoo grip in order to work, that'd be one hell of a feat to achieve. Factor in those reception issues -- not to mention the iPhone 4's other reported problems -- and it'd take a full-blown miracle for Apple to fend off Android's gains. I'm not sure any device is quite that magical.